G's third and favorite book review so far. 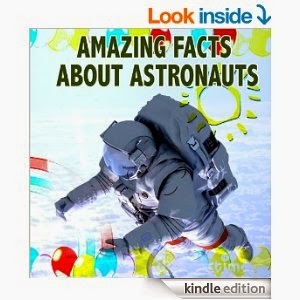 This one is called Amazing Facts about Astronauts by Dan Jackson. You can pick up this great book on Amazon for $3.00 here. True to form for this author the pics are fantastic. G and I learned so much about astronauts. He now wants to be one for Halloween. He was a little disappointed to learn that you have to have good eyesight to be an astronaut so he figures that he won't ever get to be one. Now this book unlike the last 2 seems to be worded better. The cover picture also has something to do with the book. Every page has a full color picture and only 2 lines of text which makes it easy to read. Also the pictures open up more conversation between the 2 of us. G gives this book 5 stars and I can't help but to agree with him. People who are colorblind do very well in the military. Never let being different hold you back from anything.